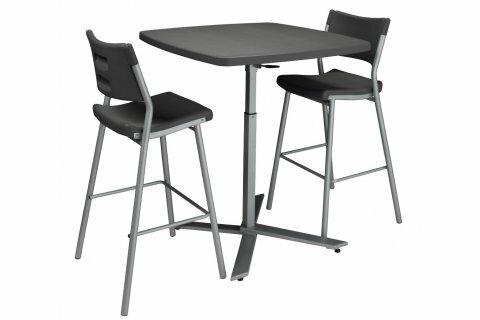 This café table and bar stool from NPS are perfect for your break room, cafeteria or lunchroom. The coordinated set has a sleek yet simple design that can fit right in with any decor. 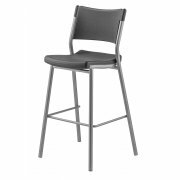 The charcoal-slate colored tabletop and stool seat and back complement modern silver-tone frames beautifully. 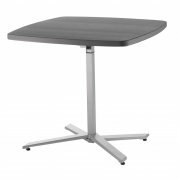 For convenience and flexibility, the table easily adjusts from regular height to café height (30-42") and the top folds down for compact storage and nesting. No matter how long a lunch break is, professionals and students deserve to sit comfortably. Café Time Bar Stools have ergonomically-curved plastic seats and backs for healthy support. A steel footrest bar keeps feet comfortably positioned. This budget-friendly café furniture set will give your space an attractive modern appeal which makes any setting cozy and inviting. Smooth Tabletop: Tabletop is lightweight, scratch-resistant and durable. Simple Fold: Tilt the latch to set tabletop into vertical position for transport and storage. Easy Adjustment: Table height adjusts effortlessly from regular height to café height (30-42") via concealed pneumatic lever. Smart Design: Contemporary-styled table legs allow nesting for space-saving storage. Ergonomic: Chairs have contoured seats and backs as well as a footrest bar for a cozy and healthy fit. Non Scratch: Rubber glides protect floors against scratches and scuff marks.